Sea nettles and jellyfish are pelagic and planktonic, meaning that they live in the water column and primarily float or drift as opposed to swimming. marine and fresh-water. They occupy environments as diverse as lakes, rivers, and oceans. About 17 percent of known biological species live in oceans. Marine species are described as either pelagic or benthic. Pelagic organisms live in the water column itself. Benthic species live on the ocean bottom. Pelagic organisms include plankton, which float along with currents, and nekton, which are active swimmers. Plankton are divided into phytoplankton, which include photosynthesizing species such as algae , and zooplankton, which are consumer species. Zooplankton consist largely of copepods (tiny crustaceans). Although plankton generally drift with ocean currents, some plankton have limited mobility. For example, certain zooplankton species move towards the water surface at night to feed, when there is less danger of predation, and return to deeper waters during the day. Organisms that are planktonic throughout their life cycles are known as holoplankton. Organisms that are only planktonic during the early parts of their life cycles are called meroplankton. Meroplankton include the larval or juvenile forms of many species of fish and mollusks . These species use the planktonic stage to disperse to new areas. Although most planktonic species are small, some are large, such as kelp and jellyfish. Nekton are active swimmers that use diverse means to propel themselves through the water. Some species swim using fins, tails, or flippers. Other species, such as mussels, move by shooting out jets of water, known as jet propulsion. 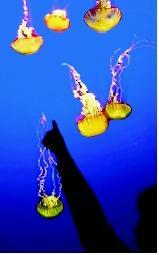 Nektonic species include fish, octopus, sea turtles, whales, seals, penguins, and many others. Many nektonic species eat high in the food chain , although there are plankton-eating species (e.g., some fish) and herbivorous species (e.g., sea turtles) in addition to carnivorous ones (e.g., seals and killer whales). Pelagic marine species may also be categorized according to the depths at which they occur. Different water depths are characterized by differences in temperature, amount of sunlight received, and availability of nutrients . The epipelagic zone describes oceanic waters closest to the surface, and is the zone richest in marine life. In the epipelagic zone, there is enough sunlight for photosynthesis . For that reason, the epipelagic zone is also called the photic (light) zone. All photosynthetic species, including the phytoplankton, live in this zone, as do many of the species that feed on phytoplankton. 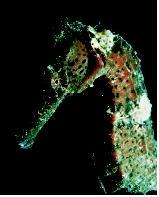 Below the photic zone is the aphotic zone, which is characterized by very limited light (or no light) and limited food. Species in the aphotic zone often depend on food drifting down from above. Consequently, there are many detritivores (species that feed on dead or decaying organic matter) in these habitats. Certain deep-sea habitats can be highly diverse. In the deep-sea vents, for example, chemosynthetic bacteria (rather than photosynthetic species) form the basis of the food chain. These bacteria obtain energy from chemical sources such as hydrogen sulfide instead of from sunlight. The seahorse is pelagic and nektonic, meaning that it lives in the water column and swims rather than floating or drifting. Benthic species live on the ocean bottoms, and represent the greatest proportion of marine species; in fact, 98 percent of marine species are benthic. Benthic species include epifauna, which live on the surface, and infauna, which burrow into seafloor sediment. Benthic epifauna include species such as oysters, scallops, sea stars, crabs, and lobsters. Examples of infauna include clams and many species of worms. 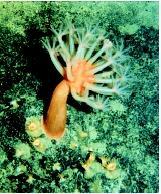 Some benthic species are sessile (non-moving), and live attached to the ocean bottom. Benthic plants generally are found only in shallow waters where there is enough sunlight for photosynthesis. However, benthic animals are found at a wide variety of depths, including in the deepest parts of the ocean. Some species, such as flounder, are capable of both benthic and nektonic existence. The distance of a zone from shore can categorize marine environments. The neritic zone describes coastal marine regions. The neritic zone is particularly rich with life because the relatively shallow water allows for plentiful photosynthesis, and because a steady flow of nutrients is washed into the water from land. Farther from land, areas of open ocean are described as the oceanic zone. The oceanic zone has significantly less total biomass than the neritic zone. The intertidal zone is the area of shore that alternates between being submerged and dry, depending on the level of the tide. Numerous species are specialized for living in the intertidal zone, including the familiar barnacles. The intertidal zone has the greatest density of living organisms among marine environments. Fresh-water habitats are extremely diverse, and include both still-water environments like lakes and ponds, and flowing-water environments like rivers and streams. Like oceans, lakes have pelagic and benthic zones. The temperature of lake water varies depending on depth, and can also change dramatically over seasons. The epilimnion is the topmost layer of lake water. It is significantly warmer than deeper areas due to heating by sunlight. The hypolimnion layer describes deeper, colder lake water. Many of the nutrients in lakes collect at lake bottoms. Turnover occurs when all the water in a lake is nearly thermally uniform and mixed, distributing nutrients throughout the water. Turnover occurs twice a year in many temperate lakes, but may occur only once in subtropical environments, or not at all in permanently stratified lakes. Lakes also can be described as either oligotrophic or eutrophic (or in between these two extremes). Oligotrophic lakes have low levels of nutrients and low productivity. They generally contain cold, highly oxygenated water and support species adapted to these conditions. Eutrophic lakes, on the other hand, have plentiful nutrients and are highly productive. Species that inhabit eutrophic lakes must be tolerant of low oxygen levels and warm temperatures. In general, oxygen levels in lakes depend on the amount of water circulation, the surface area that is exposed to air, and levels of oxygen consumption by living organisms. The sea anemone anchors to the bottom substrates: in this case, the volcanic rocks of Hawaii. Anemones are classified as a benthic epifauna: that is, living on the surface of the ocean bottom rather than being burrowed. Aquatic snakes include amphibious species that live both on land and in the water and species that occupy marine habitats only (such as this yellow-bellied sea snake). Some have paddle-like tails that help propel them through the water. 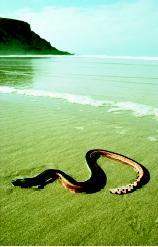 All aquatic snakes breathe using lungs, however, and must return to the water surface to obtain oxygen. River habitats are characterized by flowing water. River species generally have special adaptations for living in water currents. Some species are sessile and live anchored to the river bottom. Other species have evolved adaptations such as suckers or hooks to keep themselves from being washed away. Still other species are strong swimmers. Many of these have flattened bodies that help them resist the pressure of the current. Compared to lakes, rivers tend to be well-oxygenated because of the constant motion of the water. Temperatures can change quickly in rivers, but do not span as great a range as in lakes or other still water. Because there is less penetration of light in flowing water, plant diversity is generally lower in rivers than in lakes. As in other aquatic ecosystems, algae frequently occupy the base of the food chain. Flotation or placement in the water column is a challenge faced by all aquatic organisms. For example, it is crucial to phytoplankton to stay in the photic zone, where there is access to sunlight. The small size of most phytoplankton, plus a special oily substance in the cytoplasm of cells, helps keep these organisms afloat. Zooplankton use a variety of techniques to stay close to the water surface. These include the secretion of oily or waxy substances, possession of air-filled sacs similar to the swim bladders of fish, and special appendages that assist in floating. Some zooplankton even tread water. Fish have special swim bladders, which they fill with gas to lower their body density. By keeping their body at the same density as water, a state called neutral buoyancy, fish are able to move freely up and down. Aquatic species also have to deal with salinity, the level of salt in the water. Some marine species, including sharks and most marine invertebrates, simply maintain the same salinity level in their tissues as is in the surrounding water. Some marine vertebrates, however, have lower salinity in their tissues than is in sea water. These species have a tendency to lose water to the environment. They make up for this by drinking sea water and excreting excess salt through their gills. Fresh-water aquatic species have the opposite problem—a tendency to absorb too much water. These species must constantly expel water, which they do by excreting a dilute urine. Species that occupy both fresh water and marine habitats at different stages of their life cycle must transition between two modes of maintaining water balance. Salmon hatch in fresh water, mature in the ocean, and return to fresh-water habitats to spawn. Eels, on the other hand, hatch in salt water, migrate to fresh-water environments where they mature, and return to the ocean to spawn. Salinity is particularly variable in coastal waters, because oceans receive variable amounts of fresh water from rivers and other sources. Species in coastal habitats must be tolerant of salinity changes and are described as euryhaline. In the open ocean, salinity levels are generally constant, and species that live there cannot tolerate salinity changes. These organisms are described as stenohaline. Eurythermal species are those that can survive in a variety of temperatures. Eurythermality generally characterizes species that live near the water surface, where temperatures change depending on the seasons or the time of day. Species that occupy deeper waters generally experience more constant temperatures, are intolerant of temperature changes, and are described as stenothermal. SEE ALSO Algal Blooms in Fresh Water ; Algal Blooms in the Ocean ; Corals and Coral Reefs ; Ecology, FreshWater ; Ecology, Marine ; Fish ; Hot Springs on the Ocean Floor ; Lakes: Biological Processes ; Lakes: Chemical Processes ; Life in Extreme Water Environments ; Ocean Biogeochemistry ; Oceans, Polar ; Oceans, Tropical ; Plankton . Barnes, R. S. K., and R. N. Hughes. An Introduction to Marine Ecology. Boston, MA: Blackwell Scientific Publications, 1982. Nybakken, James Willard. Marine Biology: An Ecological Approach. New York: Harper and Row, 1982.